The first of its kind, our Biorepository Accreditation program is designed to improve the quality and consistency of facilities that collect, process, store, and distribute biospecimens for research. Our accreditation checklists, cited as a reference for best practices by the National Cancer Institute, provide a blueprint of quality practices for your facility to follow. Drawing on the collective knowledge of our biobanking and biopreservation experts, we help your facility stay current. Peer-based inspection model using inspectors with current experience in an active biorepository and qualified through a CAP Inspector training program. On-site inspections every three years using CAP Accreditation Checklists to assess compliance with program requirements. Facilities must receive, store, process, and/or disseminate biospecimens, their derivatives, and relevant data for research purposes. This program is not applicable for tissue stored for transplant purposes. With input from CAP-accredited biorepositories, the new biorepository personnel evaluation roster form ensures you have the right personnel, performing the right types of functions in your biorepository. The form supports the new checklist requirement, GEN.83510: The biorepository personnel evaluation roster is current and accurate and is audited by the biorepository director or designee at least annually. Use our database to search for CAP-accredited biorepositories. 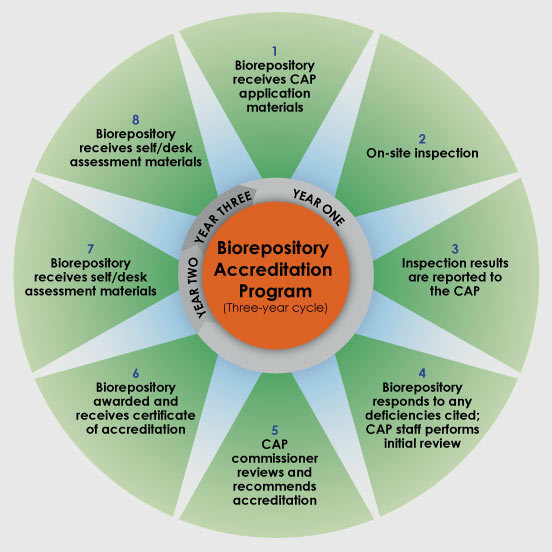 The graphic below captures the inspection cycle for CAP-accredited biorepositories.